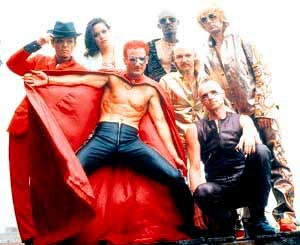 FUNK super heroes SWOOP confirmed to fans at last week's KYLIE MINOGUE concert that news of their demise had been greatly exaggerated. Sporting a revamped line-up, Swoop showed audiences material from its new album due out in August, the first new material in almost three years for the group. This Saturday night the seven-piece funk'n'fun ensemble will return to Newcastle to take over the more intimate surrounds of The Casbah. Patrons will be much better placed there to feast their eyes on new lead vocalist REBEKAH JANE, drummer CALVIN WELCH and keyboard player TETSUSHI 'THE FUNK PILGRIM' MORITA. It seems fitting that the group has chosen the song BLOOD RUNS HOT as its first single to showcase a re-invigorated line up. Guitarist JOSH BEAGLEY agrees that the single, full of the band's signature melodies, beats and lyrical twists, is instantly recognisable as a Swoop track. 'That was one of the main reasons for putting that song out as a single,' he said. When Beagley and an Adelaide school friend, lead vocalist ROLAND KAPFERER, formed Swoop in the late 1980s, it was centred around rock, funk, disco melodies and hard-edged rap. By 1993 Swoop used this formula to build an awesome live reputation, which translated into air play on TRIPLE J with DO IT and FUNKIFY from its independent debut THRILLER CD. Its major label debut, the enormously popular WOXO PRINCIPLE, spawned five singles, including the ludicrously titled, but instantly memorable track, EVERYTHING I DO FROM NOW ON HAS GOT TO BE FUNKY. It was APPLE EYES which launched Swoop internationally, doing big business in Japan where keyboard player Morita first witnessed the group. This was followed up by a cover of the CAPTAIN AND TENILLE'S disco standard DO THAT TO ME (ONE MORE TIME), which started out as a joke but ended up the fifth single from the album. 'We took a really long break after APPLE EYES and stuff after Roland undertook a six month break to complete a PhD in philosophy,' Beagley says. While Kapferer completed his studies the group sought to replace vocalist FIONA TA'AKIMOEAKA. Swoop finally discovered REBEKAH JANE on tour from New Zealand in her father's gospel group. Original percussionist CHRISTIAN 'FUTURE SHOCK' BRIEN has been moved off drums and back to percussion. The result is the rebirth of Swoop and a whole new 'album full of singles' that the band is itching to release. TE has five BLOOD RUNS HOT packs, containing a single, sticker and poster, to give away.